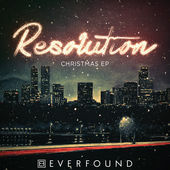 Christian newcoming sensations Everfound are back with their latest offering, Resolution, a five song EP of Christmas favorites that is a perfect change of pace for the holiday season. Even though Everfound have taken to the road for an annual Christmas tour over the last few years, this is their first collection of Christmas material and showcases holiday tunes with the synth-pop twist that makes Everfound so popular. Resolution features some Christmas classics and favorites (“Silent Night” and “O Come, O Come, Emmanuel”) as well as a few originals (“Resolution” being one of them). Not only that, but the opening instrumental classic “Carol of the Bells” is the perfect opener- not just for this EP but any Christmas album. The dramatic build up in the song is irreplaceable. The EP title Resolution is perfect and beautifully sums everything up. This isn’t an EP that fits the Christmas season. Sure, it’s a Christmas EP, but the instrumentals of Everfound will fit well for the New Year’s season too. It’s just so upbeat and dance-worthy you can’t help but keep it on for months at a time.